needed in business, corporate environments, educational settings, the medical profession and even in military experiences and service. The skill of speaking is very important to success in any career field. judged, measured, graded, scrutinized on their professional successes and even the journey, their articulation, and maybe based on how well they speak and carry or present themselves. of structure and academics. Exposure to educational, social, and networking opportunities may have been limited or not available. HBCUs should have platforms of learning that engage students in their skills of public speaking. 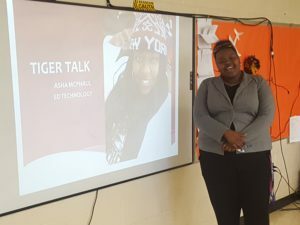 TEDX, TEDTALKS and HBCUs like Edward Waters College “TIGERTALKS” Experiences where students are provided opportunities to speak and share content. Students at the time may not appreciate or understand the importance of these events, but they need to be prepared and ready for the engagement. Contained in this blog are the links to students attending the Educational Technology, Social Media, and STEM course at Edward Waters College and links to their “TIGERTALKS” Experience. To date, several semesters of students have participated and students have shared their hopes, dreams, aspirations and plans for the PRESENT and the future. Because of these experiences now those that continue will be prepared to provide professional presentations at diverse venues. Professor William Jackson and research specialist Emma Kent of the Library Services Department of EWC strives to create in each student a well-balanced and practiced student with diverse skills they will use in the real world of employment. The need for articulation, timing, passion, confidence, and even research skills are vital to build in students a foundation that will build future success and achievement. HBCU institutions must continue to do more with less and build the leaders this nation needs for the future to be competitive and globally relevant.